Small Business Saturday only comes once a year but we understand that for any business, every day is important. 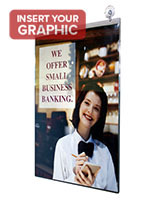 StoreFixture.com offers everyday solutions for business merchandising, signage, and operations in retail, commercial, and professional environments. Small Business Saturday is designed to increase customer traffic at local businesses across the country. Companies in every industry can take advantage of pre-planned advertising and marketing campaigns focused on increasing traffic, engagement, revenue, and return sales for small, local operations in retail, commercial, service, hospitality, and professional establishments. 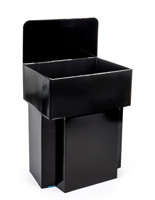 StoreFixture.com has picked our best and most economical fixtures and display accessories to help operations of any size maximize profits and increase recognition on Small Business Saturday and every other day of the year! 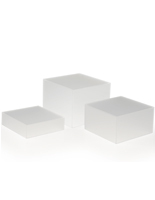 Display risers are designed to make particular items or samples stand out in a way designed to attract and engage customers. 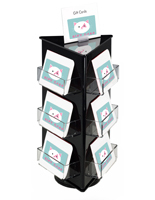 Available in single stands as well as multi-tier counter fixtures, these individual product merchandising bases are a great way to introduce patrons to new, sale, or high-end products. In addition, having multiple levels or nested bases in different sizes allows retail displays to showcase an entire line of merchandise, or present entire groups of related items in one place as a subtle upsell. Counter displays and spinners offer maximum visibility for products, while ensuring stability in high traffic environments. 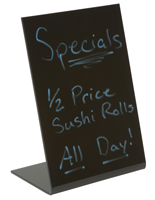 Price and signage displays are the go-to tools for retailers, retaurants, commercial service businesses, and professional environments in any industry. Styles range from simple clips for price tags or product labeling to high visibility, portable sign boards that can be used indoors or outdoors to attract traffic, to quick-change signage holders designed for mounting or hanging in almost any location. Pricing and signage displays can be especially effective during the busy holiday season, as they make it easier for busy or crowded customers to quickly identify important details. 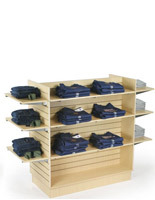 Display accessories are a fast, economical way to ensure that existing sales furniture and fixtures can accommodate current merchandise and inventory. 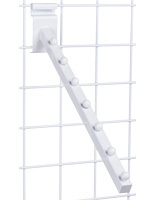 Peghooks, waterfall and faceout hangers, clothing hanger pegs, and sign holders are available in a wide variety of sizes to accommodate all merchandising styles. 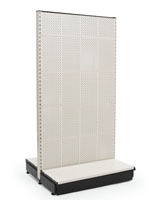 Adding specialty signage holders, changeable backers, shelving, price labeling, and other display accessories can update an existing fixture in seconds at a fraction of the cost of purchasing a new gridwall, slatwall, or pegboard panel, gondola, or kiosk. Merchandising fixtures are availble in several different formats: slatwall, grid wall, pegboard, and lightweight cardboard. These panels, kiosks, and gondolas function as stylish retail furniture that offers a wide variety of merchandising opportunities. 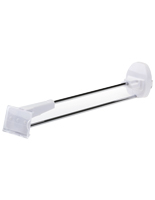 Designed for stability as well as high visibility, these fixtures easily accommodate many different styles of hooks, hangers, shelves, bins, and sign holders. Locking clips allow high-ticket merchandise to be easily accessible in peak shopping areas while ensuring loss prevention in even the most crowded environment, while cardboard fixtures allow specialized and seasonal advertising features to be easily created without breaking the budget. Small Business Saturday was established to increase visibility and encourage small businesses growth in every industry. By encouraging shoppers to recognize that quality goods and services come in all shapes and sizes, across all sectors, and by helping operations of every size to create engaging advertisements and marketing campaigns, one Saturday in November each year provides a necessary and welcome boost to engagement, revenue, and traffic. 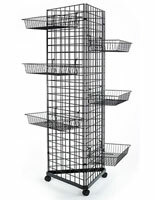 StoreFixture.com offers a huge selection of merchandising display fixtures in a variety of configurations, styles, and price points to match any need at any level. Our everyday pricing model that starts at wholesaler levels and offers bulk-level pricing on even the smallest order, as well as same-day shipping on the majority of orders placed before 2pm EST, making us a great choice for any business dedicated to improving their bottom line! 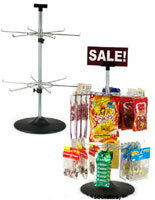 What kinds of merchandising solutions does StoreFixture.com offer? Product visibility is key in any industry, not merely retail. Restaurants, manufacturers, service operations, and of course, retailers all need to ensure that customers, clients, and passers-by can see and find the merchandise. From tabletop stands for jewelry, gift cards, books or DVDs to freestanding display racks for clothing, accessories, and toys to brochure holders for service marketing materials and daily menu specials, StoreFixture offers a huge variety of merchandisers designed to draw customer and client attention in the most high traffic environments. 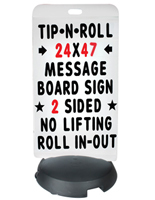 Advertising and marketing displays, as well as wayfinding and information signs can make or break any business. We offer a variety of high visibility display solutions, from outdoor signage that attracts foot and passing traffic to indoor merchandising signage, pricing labels, and wayfinding displays. If patrons can't find your establishment, they won't shop there. If customers can't find what they're looking for, they will shop elsewhere. 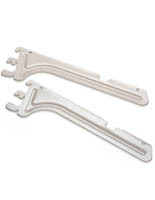 Our sign holders and labeling clips accommodate everything from merchandise pricing displays to corporate directory signs and advertising signage holders. Merchandise accessibility includes more than simply allowing customers or visitors to see the products. Retail merchandising and display accessories function as inventory storage and organizers as well as ensuring that new, sale, specialty and everyday items are easy for customers to find and engage with. Our wide selection of hooks, hangers, shelving, and bulk display fixtures allow businesses or departments in any industry to find the perfect way to showcase their merchandise! 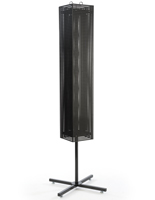 Display fixtures come in a range of sizes, shapes, and configurations to work within any store design or layout. 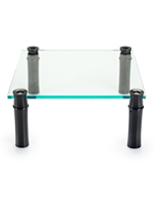 From lockable glass display counters to simple countertop spinning stands, our cash wrap and display furniture styles come in styles and sizes to meet any need. Customer payment stations and checkout kiosks range from classic freestanding wood-look cash wrap stations that do double duty as reception or customer service desks to high-tech iPad holders for self-checkout or menu ordering. Retail display cases include high-security locking glass shelves for high-end merchandise and product samples as well as open-shelf gondolas that can be used to create custom aisle configurations wherever needed. Different industries have different needs for successful operation. What works to advertise a line of clothing may not work to advertise a restaurant, or a service business. We source and offer a huge variety of display solutions in order to accommodate the needs of all industries — retail, commercial, professional, institutional, hospitality, and industrial. From the smallest small business to the largest retailer, StoreFixture.com is dedicated to providing fixtures, furnishings, and accessories to help our customers succeed, and grow!